Floors 1 – 5 are reserved for undergraduate students in 3rd and 4th year studies. 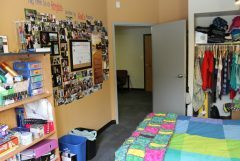 Floor 6 is reserved for students in graduate studies. Number of accessible spaces – 6 – please visit the Paul Menton Centre website for a virtual tour! 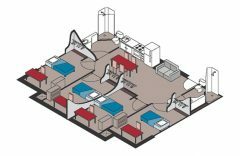 On floors 1 – 4, suites consist of 4 single bedrooms, 2 washrooms and shared meal preparation/dining areas. There are 42 bedroom suites on floors 2 to 4. 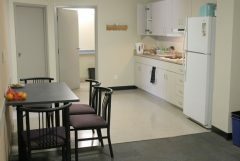 On floors 5 and 6, suites consist of 2 single bedrooms, 1 washroom, shared meal preparation/dining area. There is one 4 person suite on 5th and 6th floors. Each suite includes a refrigerator and stovetop cooking elements. Residents are welcome to bring additional small appliances. 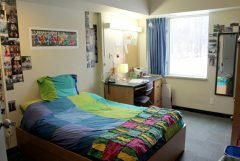 Mixed gender suite living is being offered to residents of Leeds House who have reached nineteen years of age by August 30, 2016 for the 2016-17 academic year. These suites will be offered throughout the entire building, based on demand. 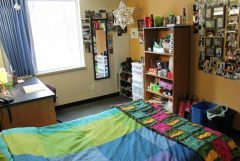 Students of different genders will have the ability to share a suite, including the meal preparation and bathroom facilities by completing the appropriate section on their Residence Information Form. Only those who request mixed gender suite living will be considered for assignment to one of these suites. It is assumed that all other students prefer the style of living in which men and women do NOT share a mutual suite. Be sure to check out a video tour of Leeds House.